Thanks for signing up again! Let’s get straight to the meat of it – the AuthoritySiteProject’s true identity is… LearnU.org! Go check it out, and then come back here for the numbers. The sales numbers for July and August dipped quite a bit, I believe this to be mostly seasonal as it is the weakest time for College students (summer vacation). That being said, there was also a structural change – on July 1st Amazon updated the way they calculate earnings for Kindle authors that take part in the Kindle Unlimited revenue share. Kindle Unlimited (KU) is a program that allows users to get access to unlimited books for free at $9.99 a month. Kindle Authors have the choice to enter their books into this program – in exchange, they receive payment based on how many people read their books. Previously, authors were paid per book download for the KU program. In July, instead of paying per download, they started paying based on pages read. This is called KENP (Kindle Edition Normalized Pages). Because the books in our library are comparatively short, this change did negatively affect sales. 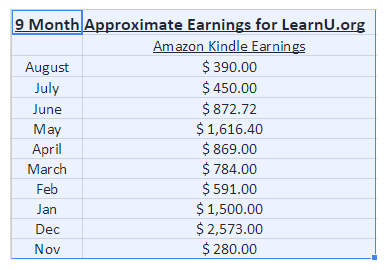 We went from about $200 in Kindle Unlimited earnings in July to about $30 in August. Based on the number of book purchases in August compared to July, we would have expected about $130 in Kindle Unlimited downloads if the old system had remained in place. There’s a possibility that this ~$100 drop in Kindle earnings a month will be permanent, but we’ll see. Amazon does a lot of cross-selling within it, so having an established profile helps earn more money per book as each book is marketed to the audience of all your other books. If Kindle Books are treated similarly to other products in the Amazon ecosystem, existing sellers should have an advantage over new sellers when releasing new products, especially if their previous products have sold well. You can think of this as a sort of theoretical Amazon Authority score. While it’s not definite that this ‘authority score’ actually exists, many Amazon sellers are confident that this is a part of Amazon’s search algorithm (which is even more opaque than Google’s). We should note that it is fairly rare to find established author profiles and Kindle libraries that are for sale since many books are tied to an actual person. In Spencer’s case, he was wise enough to create a persona. There are a couple things I’d like to experiment with that Spencer hasn’t yet gotten to. Treating the Kindle library as lead-gen.
My guess is that between the Kinde Unlimited and the direct sales, he’s getting over 500 people/mo downloading the books. With strong lead magnets, I think we could get 50-100 leads/mo through this (at the moment he gets very little as there is no real actionable lead magnet). These leads could easily be worth a $5-10 each if we did sell a course. He’s also not really experimented with promotion or pricing (aside from when a new book launches, which explains some of his stronger months). We’re not Kindle experts by any stretch, but we will be playing with things like book descriptions and promotional strategies to see if we can boost sales. Based on all the above, we feel like a 20x multiple would be fair. 25x would’ve been fine if it weren’t for the dip in sales in recent months. We used an average of 9 months earnings (we deliberately excluded November as that was the ‘launch’ month). At a 20x multiple, this values the Kindle library at $21,436, and a 66% share at $14,147. The site has a list of 4840 subscribers, spread out across 5 different segments. There is currently no funnel. I guess the process was just incomplete – but at the moment the user just receives the first message with the lead magnets and that’s it. Essay eBook – This list is just manual leads opted in from buyers and reader of the Kindle book (nothing to do with the site – there is a call to action within the book, and the reader signs up). It has 253 total subscribers, 9 of which signed up in the last 30 days..
StudyHacks -Same as above, just buyers of the book. It has 489 subscribers, 6 in the last 30 days. Career eBook – Same as above, just buyers of the book. This list has 75 subscribers, 0 in last 30. Learn UStudy Skills – There are the popups on LearnU itself (the HelloBar style banner, and the popup). It has 1085 subscribers, 20 signed up in the last 30 days. There is another list of 2938 subscribers that was an experiment on another site aimed towards students that Spencer owns. He was gathering leads from it and putting them on the LearnU.org email list, promoting a list of the best apps for college students. In the last 30 days he has received 361 optins. We are welcome to that list, and he will leave it up for a while so we can experiment with it to see if we can make a profitable campaign there and pay him an advertising fee. This is by far the largest list, as in the past 30 days the actual LearnU lists have received 35 email signups. Like his other lists, it just delivers the lead magnet but has no actual sequence and is therefore not selling anything. Overall, it is hard to say how valuable the existing lists are, since they haven’t been marketed to since May 2015. The site itself only made $21 if you average out based on the previous 9 months earnings. In this case we don’t believe the earnings are that relevant – we’d approach this site using an asset-based valuation (site-age, domain name, link profile, traffic, email lists, development and content all carry some value) rather than a valuation based on an earnings multiple. Generally speaking, you can buy a site like this for about 3k fairly easily. It’s exactly the type of site I recommend new buyers to purchase, as it has content ranking and a generic, flexible domain name. This allows you to skip the sandbox and get quick feedback. The final decision that came into this purchase was a strategic one, and was based on the promotion of this blog. Spencer is a pretty major player in this space, and he has a loyal audience interested in the development of this project. The fact that he will continue case studying the project carries value for us, as we have a new blog in need of promotion. This is also the reason we’ll focus on making improvements on the site itself rather than the kindle library, despite its valuation representing only about 15% of the total purchase price. We’ve done this multiple times with sites of this size, and we think this aligns perfectly with the NichePursuits skill-set, so we’re excited to case study it in public. Finally, Spencer’s popularity also allows us to attract talented people to work with for free, in exchange for the promotion (you’ll find out who in future weeks). Continued access to the external list – this is generating 350+ new emails leads per month, so it’s quite valuable. Re-launching the books – Perrin will be relaunching each of the books for us, which should give us a nice little boost in revenue. Using a 20x multiple on 9 month average earnings, we valued the 66% of the Kindle Library that we’re buying at $14147. Using an asset based valuation and comparable sites that we see on Flippa and from brokers, we valued the 66% of the site itself (LearnU.org) at $2000. That brings us to a total of $16147. But between Hayden and I, we actually ended up paying approximately $19000. So why the gap in valuation? If we were valuing the site in a vacuum, then we’ve probably overpaid for the project by about $3,000. However, as we mentioned already, there are a number of big-picture strategic advantages that we get if we bought this site versus any other site. The first and most obvious advantage is that there’s probably still significant interest in the Authority Site Project – and we anticipate that a lot of this interest will carry over to what we’re doing with the site. This has value to us, but in particularly it is valuable to the site that you’re on right now – WiredInvestors – which is a relatively new blog that would benefit greatly from exposure on NichePursuits. Another strategic advantage is that we intend to bring in experts to help lighten the workload. We’ll be discussing this a little more over the coming weeks, but suffice it to say that people are much more likely to be willing to help us if they can get featured on NichePursuits. Spencer also threw in a couple of bonuses, which we also mentioned already. We believe that the strategic side of this acquisition plus the bonuses makes up that valuation gap that we see (between the $16147 that we worked out and the $19000 we ended up paying). So, that’s all we have on Valuation. We plan to send out an email early next week where we’ll share detailed plans of what we hope to achieve with the site. Broadly speaking, we have two plans in place – one that will follow the Pareto Portfolio methodology, and one that will use the Monetization Overhaul method. Stay tuned for the next chapter of the Authority Site Overhaul Case Study. All the best George & Hayden. Appreciate the transparency! Thanks for showing interest! We’re really excited about this case study. Hopefully the transparency won’t come back to hurt us. Appreciate your interest, glad to have you along for the ride =). I’ll be following along with great interest. If you guys ever need a guy who has years of experience with social traffic, just call me. I’ll be more than happy to help you out. We might actually be looking for someone to work on social stuff… Can you shoot me an email and we’ll discuss this further there? Sure, I’ll send it right now. Thanks for your interest. The public reveal was actually debated back and forth quite a bit – but in the end we decided that readers would enjoy it more and learn more if we laid everything out on the table. All the best George & Hayden. great i can’t wait for the updates and to follow along. I’m definitely looking forwards to seeing what you guys are going to do with the site and how. I’m looking forward to giving it a go on this site too. Hopefully it works out for the best. I hope so too – fingers crossed! Haha – Hi Chris. I’m a fan of your podcast and your site (if this is indeed you). Exciting to have online business royalty on my site =). Good luck guys; Enjoyed reading the “TakeOver” update from Spencer, you have a great potential asset and it is exciting to keep up with what you’re doing to improve it quite a bit on both items. Very excited to read what’s going on here. I’ve been following Spencer for more than a year, and been through Hayden’s internship program. While I’m a beginner, you can count on me to read the updates and bring up some questions. Amazing insights already with valuation. Looking really forward to updates about all the improvements – or what you hope to be such 😉 I’m currently updating the UX of a friends’ educational site plus designing a new site for myself. The website I refer to here is an abandoned blog, but I might reuse the domain name plus hosting package for my new site. All the best for your project! Awesome! I am really looking forward to hearing more about what you do with the site. I have been buying and selling websites on Flippa for a few years now but only just starting to get serious with it. Excited to see how this all shakes out. Thanks for being so open with the entire process. It’s already helping me change some of my perceptions. Where do you recommend people to find these sites? Flippa and other marketplaces or some kind of outreach? And if it’s outreach – how do you identify these sites to begin with (I mean if they’re worth $3k – they’re not ranking amazingly for keywords and hence trickier to find in Google). There are sites on Flippa in that range for sure. I’ve bought 2 of them in the past in the same price range. The issue with Flippa isn’t that there aren’t good sites to buy, it’s that along with the good stuff there’s also a ton of complete garbage that you need to sift through. I’ll be following along as well. It’s great to get an insiders view on developing an authority site. Just one thought. I used to follow a very successful marketer that focused on the education niche. The marketer actually followed Spencer’s transparency in detailing earnings. One of the things that was particularly profitable were CPA leads to educational venues (ie colleges) Are you exploring that in your model? Further down the line, when the site is getting more traffic, we’ll probably look into moving up the monetization value chain. Right now our focus is on visitor growth by just putting out more content. In the future, we may shift our focus to visitor values. This is really interesting. Thanks a lot for sharing this openly and sharing your mindset and decision-making process. Can you please help me by evaluating my website.